So the wind that billowed her sheets announced to her the resurrection of the ordinary. I was actually tempted to take my title and epigraph, not from Housekeeping, but from Middlemarch: “It is painful to be told that anything is very fine and not be able to feel that it is fine — something like being blind, while people talk of the sky.” Because the awkward truth is that while throughout my reading of Housekeeping I could tell that it is very fine, I could not feel that about it at all: for whatever reason (“It must be my own dullness,” as Dorothea says), though I was struck again and again by the beauty or resonance of a moment or a sentence in the novel, as a whole it left me unmoved, disengaged. The title I did choose for the post reflects what I took to be one of the novel’s central impulses, one that becomes increasingly explicit towards the end as the rhetoric rises (and becomes more overtly religious). The story and its people are so odd, though, that I am not entirely convinced that they and their lives count as “ordinary,” or as “fragments of the quotidian,” to use another of Robinson’s nice phrases. The novel is more a study in eccentricity–though perhaps to see it that way is to be too much like Lucille, the sister who strives for normalcy, who sacrifices family for order and conventionality. Maybe in trying to read it as a novel about the grace to be found in the everyday I was making a category mistake, thinking it belonged with, say, Kent Haruf’s Benediction rather than with … what? That I thought Housekeeping was meticulously and often beautifully written became (and here I flaunt my own eccentricity, I suppose) an annoyance rather than a compensation. It felt too written, too self-conscious, and fell (I thought) into portentousness, rather than profundity, in its epigrammatic perfection: “Perhaps memory is the seat not only of prophecy but of miracle as well”; “To crave and to have are as like as a thing and its shadow”; “By some bleak alchemy what had been mere unbeing becomes death when life is mingled with it.” Wise? or just oracular? The house, the lake, the bridge: I glimpsed their symbolic potency, but they did not converge for me into a thrilling whole. I felt the tragedy of Ruthie’s losses, and the truth of Sylvie’s argument that Ruthie “should be sad,” and that therefore they should stay together, not be “helped” by separation: “There is no other help. Ruthie and I have trouble enough with the ones we’ve already lost.” I was never there with them in the moment, though. I was reading the wrong book, I think, looking for something that was simply not what Robinson was offering me. My disappointment–my loss, perhaps. Not sure I can help you appreciate it more, but this was pretty much my experience of Housekeeping as well (and Robinson more generally). Oracular, rather than wise. I appreciate this post because I gave up on this novel a couple of pages into it. (Too carefully written, and too studiously kooky or eccentric, as you put it, in a way I associate with a lot of recent-ish American fiction.) But I know this book is a lodestar for many, so I’ve always felt bad about my response. And now I don’t! Although I remember finding the situation quite striking, I don’t remember a strong emotional response to the characters either. I do, however, enjoy the author in interview; but, I’ve never felt compelled to read more than the first few sentences of her later novels either. I’m still waiting for the…right mood? 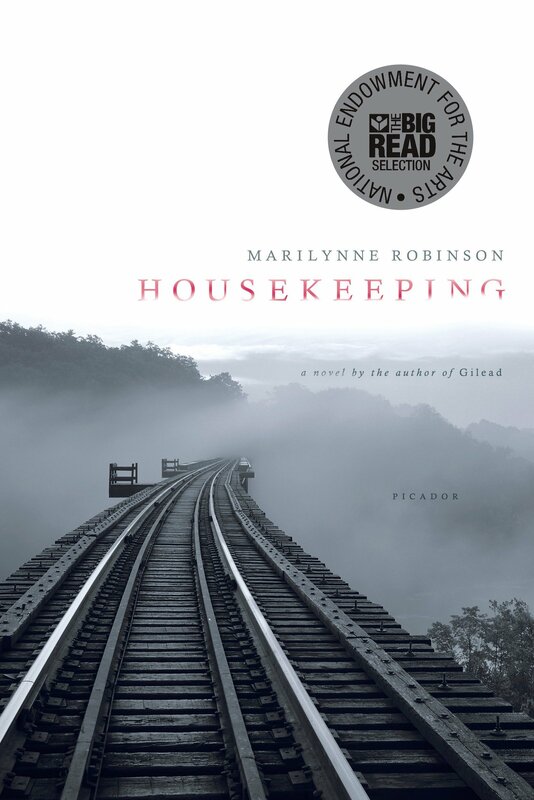 I read Housekeeping soon after it was published, in 1980, when I was twenty years old, and I had a very strong emotional response to the characters. I haven’t reread it for a long time, but remember the feeling. It was an age when I wanted to escape from my previous life, to leave the outgrown pieces of it behind me. What a relief to find other trusted readers who also fumbled this one! One reason I had such high expectations is that I thought Gilead was lovely, but I read it quite a long time ago: I wonder if she changed, or if I’ve changed. Jeanne, I can see how that would be a good time to connect with the characters. I think they are going to linger with me, too, for all my complaints: I wasn’t expecting Ruthie to stay with Sylvie and I liked their “transient” life (I thought somehow she would be able to write the novel only after having been “rescued” — though now that I think about that I wonder how we are supposed to imagine her as both the character and the narrator — because she’s a reader all along, I guess). Have you read the other novels in the trilogy besides Gilead? I adore them, especially Lila, but they are quite different from Housekeeping. I don’t find her style mannered or oracular; I do find it wise. But I think it gets simpler as it goes on. Try Lila and see what you think. I haven’t read the other ones in the Gilead series but would like to, because I thought Gilead was so good (and wise).